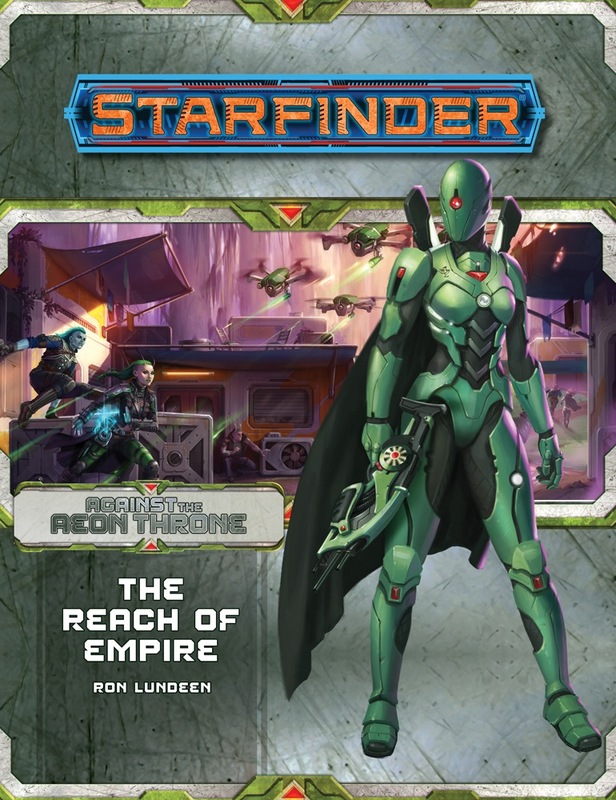 The Reach of Empire is sanctioned for use in Starfinder Society Roleplaying Guild. The Reach of Empire is an adventure with strong opening and closing acts, but one that struggles greatly in the middle with old-fashioned RPG design problems. Part 1 does a terrific job of establishing the “why” for the PCs mission to Nakondis. Positioning Cedona as an old friend of the PCs but varying the circumstances by Theme provides great role-playing fodder out of the gate and goes a long way towards discouraging “we’ll run and get help” tactics once the colony’s situation is revealed. True to space opera sensibilities, part 1 rightly wastes little time before throwing the PCs into the action as their milk run for AbadarCorp is suddenly transformed by a space battle. Groundside, three decent encounters await the PCs but none particularly stand out. Unfortunately, this is also where problems in story logic and adventure structure begin to emerge as foreshadowing for Part 2 where they will go full-blown. Specifically, the adventure assumes 3 encounters taking place less than an hour from the colony of Madelon’s Landing. Can’t people hear gunfire in Starfinder? PCs will presumably have fights with 2 Azlanti patrols and, if successful, likely have dead soldiers’ communications gear. Yet Azlanti communications aren’t fully explained until the Command Center entry in Part 2. The ground-based encounters foreshadow Part 2 problems. 1. The PCs’ ship is parked only an hour away. Why don’t the Azlanti try to capture it? 2. The free-the-colony efforts fails to utilize rich wilderness setting detailed in the colony’s backmatter writeup in order to force a dungeon-room feel. 4. The Azlanti won’t realize water rationing isn’t happening once the water elemental is dealt with? Also, who among the Azlanti summoned and bound the creature? Olaraja is a technomancer, so he could possibly have cast the spell but lacks the power to bind it. Note to Paizo – when people complain about NPCs not playing by PCs rules, this kind of stuff is why. There are good nods to some things (Azlanti language, counting the # of guards, if the PCs attack the garrison “early”) foiled by head-scratching omissions on others (Azlanti leadership/coordination; communications; colonists out-sourcing resistance to strangers). Lisa Steven’s love of Star Wars is well known. So it should come as little surprise that Paizo’s own science fantasy would have an evil empire to contend with. In The Rise of Empire, however, the Azlanti Star Empire seems to take its inspiration from the worst incompetent-stormtrooper tropes. While the villains are primarily cadets and don't have great numbers, we are repeatedly told about their discipline and training which unfortunately seems to only enable the Azlanti to make stupid tactical decisions rather than operate as a training military unit. The Azlanti Empire as presented here isn’t worth fearing. They fail to apply force effectively. They are always in groups smaller than the typical 4-adventurer party. Who performs an execution with only 2 guards? When their garrison gets breached the Azlanti all stay at their posts rather than coordinating a combined defense? And this is explained by “years of discipline”! Why the hell does the guy left in charge NOT lead from the command center (aside from the need to keep him separate for CR-appropriate shenanigans? Azlanti leadership is non-existent. The Pact Worlds have little to fear from these fools. Things begin to improve in Part 3 but easily-avoided gaffes remain. The crashed starship’s power was offline until restored by the Azlanti. Yet, the adjutant robot has been online/powered for several centuries. This leads to the robot’s “chronology circuits” being damaged so that the robot thinks it’s only been a few days. This overly complicated and ham-fisted solution could be better explained by the robot being forced into dormancy when the crashed ship’s power failed and the robot only coming back online once power was restored. To the robot, it’s still a matter of days without the overwrought hoop-jumping. It also would allow for precious word-count to be better used elsewhere. Azlanti who, for various reasons, always fight to the death is fine. However, non-lethal weapons are readily available in Starfinder and my group captured several Azlanti this way. If having the Azlanti always fight to the death was intended to keep the PCs from interrogating the enemy, adventure authors need to be aware of Starfinder nonlethal weapons. Those issues aside, the wreckage of the Royal Venture makes for an interesting and effective dungeon-crawl. Part 3 concludes with an exciting starship combat finale and does a good job of setting up the next installment. Excellent articles on Nakondis, Nakondis Colony, Madelon’s Landing, a cool colonist theme, and starships of the Azlanti Empire, as well as new Alien Archive entries. The Rise of Empire opens and closes on strong story beats but flounders greatly through the middle. The story, setup, and setting are all great conceptually but flawed in execution. Standard fantasy adventure quests and ‘monsters stay in their room’ logic are on full display and most lack a creative spark or differentiator to make them memorable. This standard fantasy rpg adventure design also prevents effective utilization of both the setting and the Starfinder rules. The colony writeup discusses mining operations and science stations outside of the main colony. Nakondis could have been a more realized setting if some of the resistance missions had leveraged these locations. Also, a fair bit of word count is spent on hovertrikes. Rather than utilize the larger setting and having vehicle combat encounters, their inclusion is relegated to a weak Return of the Jedi hoverbike homage. It’s hard to say why an adventure with great concepts and tools has such a flawed execution. With over 100+ adventure path installments, Paizo is the undisputed king of adventure path writing. They are also riffing off one of the cornerstones of modern pop culture that is loved by many of Paizo’s staff. 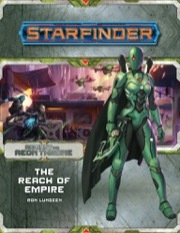 This leads me to conclude that The Reach of Empire suffers due to Starfinder AP’s significantly lower page count than their Pathfinder counterparts receive. Reach of Empire is a 4-star story that fails to utilize the tools of its genre and rpg system to its fullest (vehicles, scope, tactics, etc.). It falls back on tired tropes of its FRPG predecessors that don’t work in the scope that science fantasy affords. The result, unfortunately, is a 2-star execution. On the surface, the first installment of Against the Aeon Throne, "The Reach of Empire," hits a lot of notes that I look for as a GM. A routine mission with an established cast runs afoul of an unexpected development, and cad and crusader alike find themselves thrust into a battle against a ruthless and unknown foe. It is only after you look past the polished exterior to the AP's finer details that the flaws begin to become apparent. The AP begins with a cast of level 1 characters who are all presumed to know and work with each other traveling to a colony in the Vast on a routine supply mission. Each PC has their own connection to the colony through a plot-critical character, as outlined by the PC's chosen theme. In a way, this serves to provide each character with a personal stake much in the same way Campaign Traits did for Pathfinder APs. Unfortunately, unless the GM shares the first few pages of the AP with the players, they have no way of knowing about this connection ahead of time when building characters, so it almost feels like the players are ambushed with a connection to the story they did not have a hand in crafting. In my experience, this means players will be less likely to act on that roleplaying hook, since it was not a decision they made and therefore they have little emotional investment in it. Nonetheless, the effort to ground the PCs within the story is appreciated, and I hope to see more elements like this in subsequent Starfinder APs (perhaps even AP-specific themes, or a Players' Guide that explains the significance of each theme and its connection to the story). After the inciting action, an artfully-done encounter that plays up the threat of a mysterious foe, the PCs transition into the main action of the book, and into a sandbox-style adventure for them to investigate and explore. The AP does a good job taking into account the various actions the PCs might take, and also takes care to provide bits and clues about the PCs' enemies that builds a more complete picture over time. The sandbox section culminates in a daring raid on the enemy stronghold, which, while still somewhat a dungeon crawl (albeit a brief one), provides the PCs with various options on how to proceed through it. The final part of the AP sits on somewhat shakier ground. A proper dungeon crawl this time (again, brief), the dramatic action culminates in an explosive finale that bookends the adventure rather well. Unfortunately, there are a few plot holes in this final part, and particularly astute players might raise questions about the strange decisions their foes make at this point in the story. Despite this however, the overall flow of the narrative is solid, and leaves the players (likely) satisfied and eager to continue on to part 2. The AP offers no explanation as to why the enemy, when faced with dwindling forces and vastly outnumbered by rearmed and angry colonists, would continue to fight to the death. Indeed, there seems to be no consideration that the PCs might lead an army of one-hundred or so angry colonists to confront the final, token occupation force. So, I have just spent most of my ink praising the AP for its content. Why then does my title allege differently? It all comes down to the details of the AP itself. "The Reach of Empire" does little in the way to introduce the principal villain or their motivations, raises questions about the villain's competency and plan, and only teases a plot-critical character without developing it further. In other words, very little of the actual plot gets developed in this book. The only thing that the players know by the end is something they learned relatively close to the beginning, with the addition of one or two facts that aren't really relevant because they already had a personal stake in the story anyway. The adventure background tells us that the ultimate villain of the campaign is a minor Azlanti noble who overstepped his authority in pursuit of a secret project in order to improve his political standing within the Empire. While all of this is plausible and makes for really good television, the players have no notion of who is ultimately responsible for the invasion of the colony. There are ways that this can be handled, such as communications from the noble to his minions in the colony, or even just foreshadowing who the villain might be. For example, "Rise of the Runelords" introduced Karzoug in the first book, although the PCs would not learn who he was until at least the fourth book. Without this connection, "The Reach of Empire" feels somewhat isolated from the next two parts of the AP. The villain's plan involves occupying a colony with effectively twenty-four high school students and two Aeon Guard soldiers. While it makes sense that the villain wants to keep the head count low in order to maximize secrecy, one can only imagine the political scandal a headline like "Local Lord Loses Entire Academy Class on School Field Trip" might cause--which is essentially what happens by the end of the first book. Overall, "The Reach of Empire" is a good start and a good skeleton to work off of, but definitely requires the GM to write additional content to fully flesh it out. Vignettes exploring each PC's relationship with a plot-centric NPC, and asides or scenes that foreshadow the main villain, are both needed in order to really make the story substantial, and connect it to the AP's overarching plot. If this is not done, players are mostly left to assume the dramatic stakes of the story based on a few sentences at the front of the book telling them "you like this person and want to save them." In the end, I would give "The Reach of Empire" 3.5 stars, but since fractions are impossible I'll round up to 4 because I like the ideas presented within, even if they needed a little more time to develop. The developers & Ron Lundeen seem to have thought about everything the players could do in this perfect little gem. The adventure reads like a great mix between railroad & sandbox. Everything is structured perfectly, every character theme gets a different reason for being on the mission. The bad guys act really believable and as logical as a military unit would. Nakondis is a colony that seems to be real enough to exist somewhere in the Vast of space. The amount of information about the Azlanti space empire in this book alone would suffice to build a campaign in their empire. should have been advertized in a players guide, as it makes chosing certain races like Ysoki, Vesk or Kasatha less ideal than humans, androids or lashunta. It is possible to play those, but some things won't work. Having no dice from Q-works yet and seemingly having to wait until march 2019 for the pawns. The first "short AP" begins so great, that i am curious if the other parts can keep up. There are no lenghts in this volume, it reads like a 90 minutes nonstop action movie! So, you're saying we get to fight the empire! No, we will serve the Empire! Please stop doing cool things! It’s taking up all of my free time and (just between us) some of my work time! Bigger problem ... Rent or Paizo? This is an interesting change, a 3-Part AP on Monthly schedule, still a 64 page-count though. This looks exciting! I have thought that the Azlanti were the coolest sounding badguys in the setting from day one. Super pumped about the accelerated production schedule! Just curious, could we get a level range for each installment? Thanks in advance! First AP was pretty dull. Bit too early to say first AP was dull considering only half of it is released, though to be honest I have to agree it feels more like Council of Thieves in scope while I was hoping first AP of Starfinder would be like Rise of the Runelords aka starting new setting with a bang. Hm, only 3 installments, now that's a change. So I guess this ends at, what, level 7 to 8? If the first AP is any indicator, at level 7 (that´s what AP #3 ends with). Is this because there’s no modules? Need more low-level adventures and options to play. I was sort of hoping we could slow walk our way to the Azlanti because they seem like a massive threat. I'm really sad these don't get into higher level stuff. I want to play some higher level Starfinder, to see what it's like, but Starfinder APs don't seem to want to support that. I’m sure there will be a bigger AP involving them some day. This is a minor peripheral system you’re saving. Starfinder's been out for less than a year. I'm sure there will be plenty of 3PP support, just give them time. Pathfinder's had nine years to grow into it. ... And the Adventure Paths already had a multi-year lead on the Pathfinder RPG. So, while we are all just speculating, would you tell us what is the rationale for a three part AP here? Since Rob is the creative director for Starfinder, he'd be a better person for more details, but I can say that since we have a new line of Adventure Paths for a new game system, it seemed like a good time to experiment with how we present Adventure Paths. I'm curious to see how readers like or dislike this small change. I'm interested to see more of this mini adventure path. Increased frequency to monthly is very welcome. If the page count is brought up to the same as their Pathfinder I'd be very interested to see something like alternating between a three part adventure path like this and then a six part adventure path. Something like that would be very nice, you don't always want to launch into a huge long adventure path but would still like a hand to get the game going. But I do enjoy the longer adventure paths, so although a bit of variance like this is something I'm receptive to I'd be disappointed if it led to a loss of the nice long epic ones. Hmm though I really hope to see some expanded adventure paths that go up to if not close to 20. More is more. Curious why its only three installments. I can see my players not really wanting to start over so soon with their characters only 12-13ish level at the end of the first path but I do love that we are getting some info on the Azlanti Empire! one rationale could be that part 6 of an AP never sells as well as a Part 1. They certainly get played a lot less. It will be cool to get the story completed with less padding needed. For myself I have completed 3 AP and partially 6 more. This AP also appeals as it seems to have nothing to do with any soiety connection. I actually like the concept of a 3 part adventure path. Maybe not always, but I could see value in having a variety of 3 part paths at various starting levels so you can chain them together as appropriate for your group. I will have to look at stealing the plot of this adventure path and scaling it up for this fall. A mini-campaign against the Azlanti Star Empire would fit into my campaign well by that point. I agree that I like the idea of a 3-part adventure path, but they took out the wrong part. They left in the frustrating low levels, and took out the levels where it starts to get fun. Although, I will admit I don't know where that line is in Starfinder yet. In Pathfinder, I tend to think the fun begins about level 5 (third level spells for casters, first iterative for full BAB characters). Things get really fun about level 11, and I have yet to play enough in the 16-20 range to have an opinion. If the lower tier sells well enough, then there will be a huge demand for higher tier APs. Which means they might be able to build APs that take characters to 20 without exceeding the 6 chapter AP concept? Return of the Runelords goes 1-20. All you need to fit 20 levels into 6 adventures is use the fast XP progression instead of the default medium. However, that requires quite a bit more work by the GM. Having it a 'solid' path to 20 versus a 'GM needs to make a lot of work to keep it challenging' could be a good selling point. How does it require more work by GM? It's exactly the same AP, you just need less XP to level. If L18-19 powers/items/wealth/equipment is allowed, then the GM needs to modify the scenario to compensate for the additional power increase. ...otherwise there's no challenge to the party. I am talking about the upcoming Return of the Runelords, which is 1-20. As written. You won't have to modify it. That's an outlier, I think? Most APs end around the 15-17 range, if memory serves? There was a post somewhere where the developers and/or design team were talking about the amount of work involved with a 1-20 vs. a 1-16/17 and why the 1-20s were rare, but I can't remember where it is. c) level 20 requires CR 20+ foes, which again, is only recently that Paizo has ample amount of in existing print. I am sure others will be happy with it , but the trend for low level starfinder is disappointing for me. The shorter length, and lower ending level, makes sense if this AP is but the first part of a two or three part campaign. While I'm excited that the adventure involves Azlanti Star Empire--one of the cooler potential enemies from the Core book--they seem like a more epic-tier threat than levels 1-(7?) implies. I'm okay with giving a 3-book campaign a shot as well. My groups typically meet weekly for 3-5 hours a pop and it can still take us months to get through an AP book (admittedly that's at Paizo's medium track) and life always seems to get in the way of completing a path. Maybe a smaller, more focused adventure path makes more sense. Do we know for sure all 3 part aps will be starting at level 1 though? I mean, 3 part ap could serve as "hey, you want to run something after ap that ends on level 12? Well good news!" I don't think we know anything for certain about the planned level ranges of any of these adventure paths. I would imagine that they will stick with low level adventure paths until the game system matures a bit, but later on, who knows? We know the first three-part AP starts at level 1, but nothing beyond that. It's funny how these things go, I'm so used to hearing people talk about how much they don't enjoy high level play when it comes later modules of an AP, or goodness forbid going from level 1-20. This is really refreshing. I'm just enjoying the opportunity to have both. That would probably be the case if this adventure path were "Destroy the Aeon Throne." But it's about working against its machinations. That can start small, but blossom into much bigger things. Here, it starts with liberating a colony in the Vast from the oppressive control of the Azlanti Star Empire--you get to be the rebels, and that's really fun and totally appropriate for low-level heroes. But why have the Azlanti reached out so far into the Vast? Finding that answer is what unfolds into the bigger things. As an aside, now that I'm a developer here and privy to super-secret secrets, I'm excited for the next 2 adventures in this AP to be announced--because they really ramp up the awesome from the already-awesome "rebels against tyranny" beginning! But why have the Azlanti reached out so far into the Vast? Because the Azlanti empire is entirely in the Vast, and their peer competitors are not, so it makes sense for them to pick off systems out there rather than push towards the Pact Worlds and risk fights they can't easily win for the questionable prize of still having a really long trip to get back to their homeworld? Personally I'm very interested in single adventures and shorter adventure paths that can highlight different areas and aspects of the setting (need some adventures that revolve fully around the Pact Worlds). The gaming groups I game with only play campaigns lasting up to a dozen sessions and up to around 11th level so Dead Suns suits the group much better than Pathfinder adventure paths. We also tend to some of these books more for inspiration, using maps and characters/setting areas but not the adventure itself. This is where the Golarion setting books for different countries are excellent and I really hope there will be equivalent books for areas of the Pact Worlds. If enough people are interested that I'm certainly fine with Paizo putting out some longer adventure paths going up to higher levels (even though I wouldn't buy or play them) - diversity to cater for different customers is welcome. But I hope the shorter AP is popular enough that we see more of that format! I'm fine with a shorter AP. Variety is the spice of life. My question is, will this be Starfinder AP #7, or will the numbering start over for each Starfinder AP?